I am so excited to Welcome a New Collector to my Family of Collectors! “You Have To Win Her” is now in a new home, Thank you for collecting this painting, I hope it brings you so much joy! 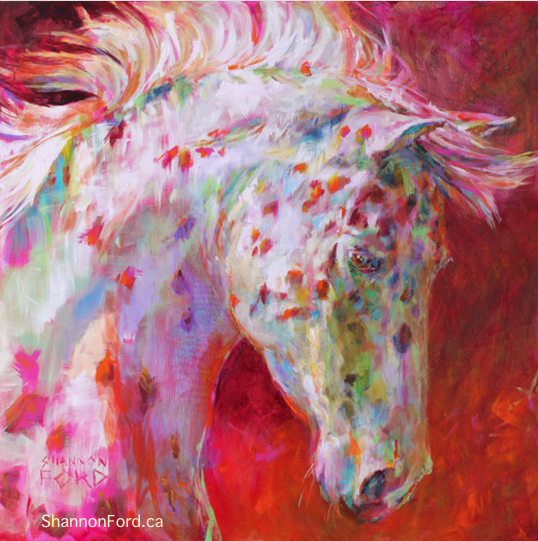 And, with Thanks to Gainsborough Galleries in Calgary, Alberta for representing me and helping Art Lovers collect the painting that calls to them!This painting was inspired by Rocco (Rock’N Roll Train) , a Red Leopard Appaloosa who has been the subject of many of my paintings. He lives with the Opsahl-MacDonald family south of Calgary. He was one of the equine liberty performers in the “Tails” show at the Calgary Stampede Centennial. Rocco was bred by Heather McLevin of Thunderstruck Ranch.